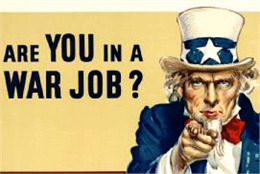 During World War II the U.S. government organized the largest home-front propaganda campaign implemented up to that time. Its goals were to boost morale and sell war bonds. Milwaukee's Gugler Lithographic Company worked alongside Bugs Bunny, Judy Garland and Norman Rockwell to help mobilize public support for the American war effort. Beginning in 1942, Gugler worked for the federal War Advertising Council to encourage voluntary compliance with rationing and service programs, inspire patriotism, promote home-front morale and sell war bonds. The artists whose work the Gugler posters depicted relied on red, white and blue color schemes, flag motifs and the iconic Uncle Sam to invoke a sense of duty and civil responsibility. More emotional approaches depicted the chaos of battle and the general plight of soldiers in the field in order to bring the war closer to home. Stark contrasts were also used heavily, with the darkness of war juxtaposed against bright projections for a triumphant future. Popular themes called on civilian pride, the virtue of charity, the respectability of hard work done well, and the terrible consequences of failure to respond appropriately to wartime advice. The most successful and widely known campaigns on which Gugler worked were those for Savings Bonds (1942-1980), Security of War Information (1942-1945) and Women in War Jobs (1942-1945). 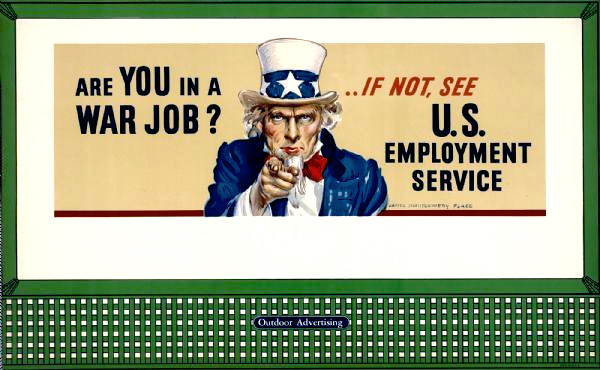 The Savings Bond (also called War Bond or War Loan) campaign was the Advertising Council's most successful. 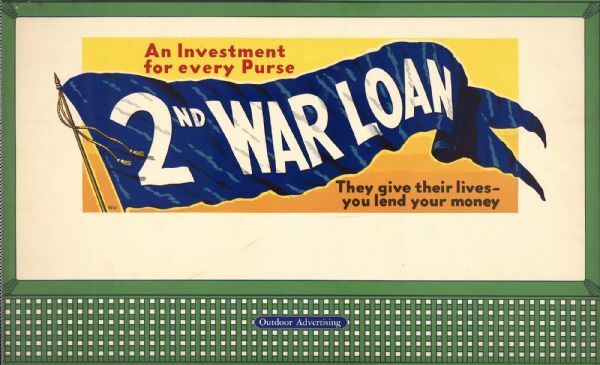 It encouraged Americans to help fund the war effort by purchasing bonds. With their promise of respectable interest and associated sentiments of patriotic responsibility, bonds offered an easy and smart way to invest extra money. The Security of War Information campaign reminded Americans to be discreet in their communications in order to prevent information from being leaked to enemy forces. The possibility of important messages being intercepted or spies ferreting out vital facts was a real concern. Just as soldiers were advised to keep their whereabouts unknown, their families were warned to keep silent about matters of possible importance. The Women in War Jobs recruitment campaign encouraged women to leave home to fill positions in jobs such as civilian services and in war production plants. Between December 1941 and February 1943 the number of women at work rose by roughly 2 million. The number continued to increase as employment outside the home became more socially acceptable. Other Gugler billboards promoted food conservation and rationing, volunteer recruitment of women for military service, and even forest fire prevention. The company was started in 1878 by German immigrant Henry Gugler (1816-1880) and his two sons, Julius (1848-1919) and Henry Jr. (born 1859). By 1883 it had 55 employees and handled all advertising for Pabst Brewing. Twenty years later it had grown to more than 100 employees. By World War II it was one of the state's largest and most successful printing firms, with subsidiary offices in Chicago and New York and a nationwide portfolio of corporate clients. In 1956 the last member of the Gugler family interested in the firm passed away, ending family control of the business. In 1966 it was acquired by Journal Communications, and in 1973 left downtown Milwaukee for a new plant in suburban Brown Deer. Not long after Gugler's 100th anniversary in 1978, NorthStar Print Group acquired Gugler and its factories; in 1999 NorthStar was fifth largest Milwaukee-area printer. It was acquired by Multi-Color Corporation of Cincinnati in 2005, by which time Gugler's brand identity had all but vanished.